A written forest management plan is advisable if you intend to keep your property, and especially if your property is large and diverse. The plan consists of identification of your goals, an accurate map and inventory of timber types and soils, management recommendations, and a schedule for their implementation. A timber appraisal is part of our plans, as well as a growth projection to show you what you will have in the future. For large properties we offer computer-based GIS systems. Federal cost-sharing is normally available for forest stewardship plans. This can reduce or eliminate the cost of the plan. A forest management or stewardship plan qualifies you for membership in the Tree Farm program. We have a number of clients — trusts, pension funds, hunting clubs, etc. — who are absentee owners of large properties. These properties often need routine surveillance, management of hunting, and spray programs, in addition to traditional timber management. Parkton Woodland Services offers programs tailored to such properties at reasonable annual rates. 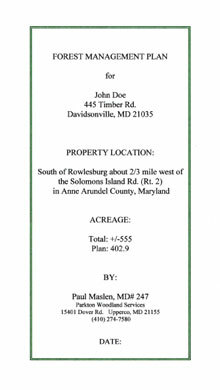 The Maryland Forest Conservation Act (FCA), enacted in 1991, impacts forest landowners in two major ways. First, anyone who harvests timber on an area of one acre or more must obtain a sediment control permit. A required part of this permit is the recorded “Declaration of Intent” not to subdivide the property for 5 years from the date the permit is obtained. The exact regulations vary from County to County, but anyone considering subdivision must consider the FCA in their planning. Second, subdivisions require a “Forest Stand Delineation” and “Forest Conservation Plan”, and possible tree planting to mitigate for clearing. We can guide you through these processes. 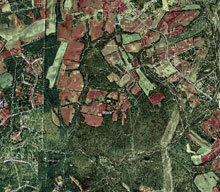 Aerial photo of wooded property.